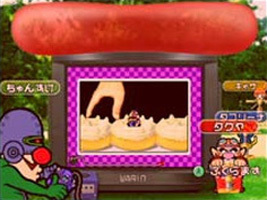 A multiplayer party version of WarioWare, Inc.: Mega Microgames. Up to four players take part to compete in a series of seconds-long "microgames" until only one player is left standing. There are four different game modes to play with the full set of microgames from the Game Boy Advance version, randomly selected. Play microgames in a random order. If you lose three times then you lose your audience. Win all-new multiplayer microgames to give other players more turtles to sit on during "patience time". A boardgame similar to Reversi/Othello where the more ambitious you are for places on the board, the more microgames you have to play. Play microgames while carrying out the orders of the doctor, and the other players rate your performance by applauding. The microgames in this game are the same as those found in WarioWare Inc.: Mega Microgames on Game Boy Advance. This cameo listing will only feature cameos exclusive to this game. 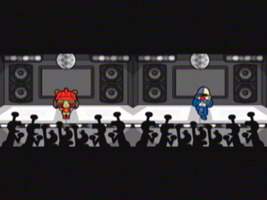 During the Dance Fever game, the crowd in front of your character is made up of dancing, shouting Mr. Game & Watch. Mr. Game & Watch was a character created for Super Smash Bros. Melee to represent the classic Game & Watch games. 9-Volt's multiplayer mode features a Game Boy Advance and an e-Reader.